India has pledged more than $500 million to develop the strategically located port of Chabahar -- roughly 1,800 kilometers (1,110 miles) from the capital Tehran -- since it first expressed interest in 2003. Yet repeated delays have prompted Iran to turn to China in the hope of speeding up construction. China’s development of Gwadar, a port down the coast that is a showcase of President Xi Jinping’s Belt-and-Road infrastructure initiative. The shift makes sense for Iran, which wants to ensure Chabahar is an economic success. But it could be a strategic loss for India, which opposes China’s expansion in the Indian Ocean and is already worried that Gwadar could one day be used as a military base -- along with other China-backed ports from Myanmar to Bangladesh to Sri Lanka. Any formal investment from Beijing would further weaken the strategic advantage for New Delhi to invest in Chabahar, which is close to Pakistan’s western border. 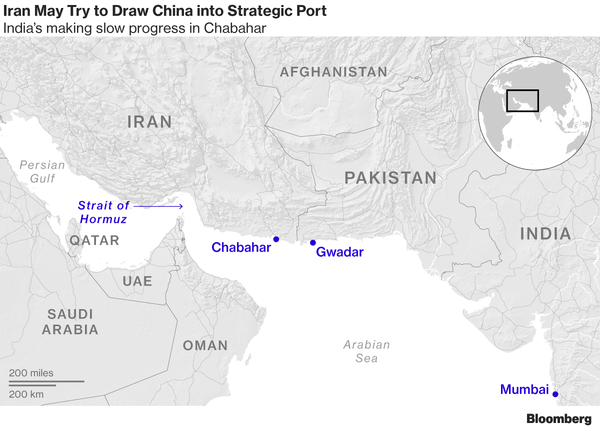 The Gwadar port is part of Xi’s plan to finance $50 billion in infrastructure investments in Pakistan, and Chinese merchants already have a foot in Chabahar. "Delhi would likely take the view that any Chinese presence at Chabahar, even if not involved in the operation of the port, could be used as a way of undermining India’s influence with local authorities,"
China has overland train connections linking China to Iran and “huge” investments in the country, said Manoj Joshi, a distinguished fellow at the New Delhi-based Observer Research Foundation think-tank. "China is much deeper there than India." Iran’s invitation to invest was welcomed in Pakistan. "It’s a positive statement that came for the first time from their side," Dostain Khan Jamaldini, chairman of the Gwadar Port Authority, said by phone. The two countries are already discussing a new ferry service that would link ports in Gwadar and Karachi with the Iranian ports of Chabahar and Bandar Abbas. Cooperation between the two ports could be awkward. India and Pakistan are historic foes that have fought several wars, while India and China -- which recently faced in the Himalayas -- are battling for geopolitical influence in South Asia. "The priority is with the Indians -- they’ve been involved and came forward first," Jamili said. "But if another investor comes along and is interested in Chabahar, there is certainly enough space and opportunity for them and for their investment." India first okay to help Iran expand Chabahar port in 2003, by building two terminals -- a multipurpose cargo terminal and a container terminal. Progress slowed particularly as Western nations imposed sanctions on Iran, which were lifted in 2015. Delays have persisted since then, including a two-year dispute over whether India would pay $30 million of excise duties on port equipment imported into Iran. "Significant progress" has been made at Chabahar, Kumar said, noting it was Iran’s "prerogative" to choose its partners.